Ask fellow campers about "Warren Dunes State Park" and nearby attractions. We stayed two nights on our way West to break up the trip. Upon arrival, the unhappy office person charged us $9/day per vehicle (RV and toad) totaling $36 for two days, plus the camp fee of $62. We had previously paid $8 to reserve a spot via website. Pretty pricey for a spot with 50amp service only. The site was ok, wide and long enough for our rig, but the fire pit had cigarettes in it and there was an old carpet that someone had tossed into the woods behind the site. Pros were the cool dunes and Lake Michigan. The showers were individual rooms, and clean, but water wasn't very hot. Our site was shaded, and overall, the park is super quiet except for the traffic sounds, which weren't too bad. The person working the gift shop was lovely, happy and glad to be there. We camped at Warren Dunes State Park in a Motorhome. See the dunes and Lake Michigan. Great dog beach available at the park, but it's a long walk through deep sand, and our 12 yo pup had to rest as we got nearer to the beach area. Worth the trek, however! The location of the park is very nice and beach access is a fun tromp through the dunes; however, we were terribly disappointed in the space we were given. If you come here, be sure to drive around the park, mark down the spots that look interesting and then ask for those. We were driving a long way and really needed a nice place to rest before moving on the next morning. We took spot #164 as assigned and found it to be a spot that was absent-mindedly created out of a corner. There is a sign in your way, the bushes are thick and hog up the majority of the space and the spot isn't level. And, to top it off, the fire pit was full of gross trash from the previous campers. We were didn't realize until walking the other loop to take the dunes trail that other far more appealing sites were to be had. My Mr. was too tired from driving and didn't want to request a different site after he had already put down the jacks and got the AC running. I don't know if it was because the park employees try to get this spot "sold" first or what, but for $31 + $9 for the park pass is way too much for what we got. I highly doubt we'll stay at this park again, but if we do, I'll be far more picky about which site we get assigned. For the record, site #54 looks spacious, shaded and has 50 amp service. If it weren't for the nice dunes and the "better loop" I'd drive right by and never give it another thought. We camped at Warren Dunes State Park in a Motorhome. The dune trails were lovely and the beach looked very nice. But you can take advantage of that for $9 and not have to stay at this park. I would visit this park again due to the unique sand dunes and the lake BUT only off season and not on a weekend. We camped at Warren Dunes State Park in a Motorhome. Visit the Town of Sawyer and the Goodbush Brewery restaurants. Clean during our visit but there were a couple dozen sites occupied, if this was peak season it would be different. There is additional $9 a day for out of state residence nightly fee does NOT reflect this. Daughter rented a cabin next to our site had very musty smell probably from being closed up for the season. We camped at Warren Dunes State Park in a Travel Trailer. I was happy that we decided to take a chance on this park after the previous reviews. We camped on a weeknight near the end of June and found the park to be about two-thirds full; it did not feel overly crowded. Our site was long enough that we did not need to unhook our 35 foot 5th wheel. It was a great place to break up our cross country drive. The kids loved playing on the sand dunes and swimming in the lake. The bathrooms were modern and clean. We would definitely return. 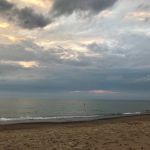 We camped at Warren Dunes State Park in a Fifth Wheel. This is a beautiful park when it is not busy. Holidays are a nightmare because it is so crowded and noisy.The best times to stay are off season as they are unable to keep up the bathrooms when it gets busy. The cabins are nice but also do not recommend when the park is busy. The area itself is beautiful and the beach is awesome. Try to avoid the holidays as it becomes a "sardine can". We camped at Warren Dunes State Park in a Tent Trailer. This is a must stop park if you are traveling on I-94 or even I-80/90 and you have a day or two. From an RV perspective, it's a nice, basic state park with the advantage of 30 & 50 Amp service. No water or sewer, but they do have a good dump station. The real attractions are the sand dunes and the beach on Lake Michigan. It's very nice and unique. And each site has these industrial strength fire pits for some nice campfires. I was fortunate as the park was probably only at 20% occupancy, so I felt like I had the place to myself. I had my pick of sites, and choose a very easy drive through site. It is a little close to I-94, and at night you can hear the trucks off in the distance. The staff were very nice and helpful, but they were definitely all business. The no alcohol signs were everywhere and you could just tell, it was not a place you wanted to be drinking from a open container. Definitely a solo cup environment. But if you want to spend the day hiking the southern shores of Lake Michigan, this is well worth the stop. We camped at Warren Dunes State Park in a Motorhome. Great location if you want to spend the day on the beach. Dunes access is within the park, about 2-3 miles by car. There are walking trails available, but we did not take them. Sites are narrow but wide. We previously owned a pop-up and booked when that was the equipment we had. By the time our weekend came, we had purchased a 25 ft travel trailer. The park has about 4 sites that are they do not reserve on line. We were able to switch our site and obtained a pull through. Site 92...perfect for new travel trailer owners. Simple in and out. Typical state park..not much grass, our site was very level. The people were very nice and helpful. We will be back We camped at Warren Dunes State Park in a Travel Trailer. One of my favorite places to camp. You cant beat the dunes and lake Michigan. We camped at Warren Dunes State Park in a Motorhome. While the campground is nice, some spots are very small, others are a nice size. The beach is very nice. The Bathrooms could of been cleaner, and stocked better. My husband went to use the bathroom, and only one stall had toilet paper. Now this campground, like all the campgrounds on the west side of state is alcohol free. You see signs coming into campground, and it is stamp on your pass. I MUST WARN you if you do bring ANYTHING in be very careful. We pick up my son and his girlfriend from the train station in Indiana, and did stop to pick up a case of beer (cheaper there, no deposit). We got back to the site, it was dark out, and we had the case of beer in the trun. The trunk was open less than 5 minutes, DNR drove by saw it. They stopped, made them empty every can, plus they found a few in the cooler (emptied those too). The guys had also just open there first beer, which were in coolies on table. The DNR found those. Both guys got a ticket for $160 each! And were told they could kick us out of the park (which they didn't). None of us were loud, drunk (they hadn't even had a first beer yet). We met others in campground that said they had alcohol, and we warn them to be careful. We are all adults age 24-54, and we just like to enjoy a drink or 2 at night. We chose this campground because my son and girlfriend live in Chicago, and they could take a train to meet us. I don't know why at some of the state parks you can't have alcohol at your site. The bathrooms could of been cleaner too. There are no camp hosts. Some sites are very close and narrow (not deep). We would go back again, but chose our site more carefully, and back our car in (instead of having the trunk facing the road). We camped at Warren Dunes State Park in a Tent. We camped here for 4 nights with family in 2 adjoining sites. The campsites were shallow but wide and ours were shady. There were only a few other campers in the park this early in the year. The dunes are great for hiking and for children playing on. The beach must be hiked to as the road is closed due to a bridge being washed out last fall. The restrooms were not as clean as I would have expected for as few campers as there were, and did not seem to be maintained well. One toilet would not flush as was that way for several days. The showers looked nice, but all except one had cold water. If you knew which one to get you could get a hot shower, but the others were cold. The shower floor drains did not drain well, and water ran out into the dressing area. The one night, there was a half an inch of water in the area I was standing in to dress. Also, with all of the sand, they needed to be cleaned more than just in the morning. Maybe they were not geared up yet with staff, but if the park has these kinds of troubles with a handful of campers, what will it be like in the summer? I would only come again if the family really wanted to spend time at the dunes. We camped at Warren Dunes State Park in a Tent Trailer. Sites were small and close together or else this park would have gotten a higher rating. The beach is one of the best on a lake. The dunes make for fun hiking and are quick to wear kids out (means they sleep well at night! Nearby towns offer many things that you might have forgotten. Be sure to check out St. Joe, as it has some good beaches and a great little downtown shopping area. We camped at Warren Dunes State Park in a Tent. This is a nice state park. Our kids loved climbing and exploring the sand dunes. The bathrooms were ok, and the individual shower rooms were nice. The commute to Chicago was reasonable. We enjoyed our stay. The only negative was the daily motor vehicle permit fee which was in addition to the camping fee. We would stay here again. We camped at Warren Dunes State Park in a Tent Trailer. Loved camping here for the beach, a beautiful beach in Michigan, not too far from Chicago. We stayed in #36 with extended family in two adjacent spots. #38 was an awesome site, very private with trees. It was a bit loud at night with many college kids (didn't seem to be too much ranger interaction there.) The bathrooms were not the best...very muddy due to the sand but I don't think the appropriate steps were taken to keep it clean. Would I stay here again, yes but just for the beach..the campground was just ok. We camped at Warren Dunes State Park in a Travel Trailer. Are you affiliated with Warren Dunes State Park ?